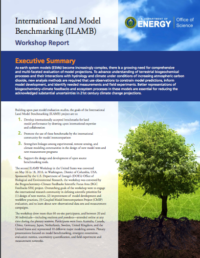 The International Land Model Benchmarking (ILAMB) Package provides a variety of in-depth diagnostics of more than 24 terrestrial biogeochemical and hydrological model variables on annual and inter-annual time scales. It compares these variables with over 60 site-based, regional, and global observational data sets, and scores model performance based on a combination bias, RMSE, and seasonal cycle metrics. Relationships between many biogeochemical variables and physical driver variables are calculated from model results and compared with observational estimates. ILAMB is useful for detailed exploration of land biogeochemical and hydrological model responses and provides an interactive interface designed to enable the user to more rapidly understand the underlying drivers of those responses.